Although Samsung has yet to issue any confirmations on its new Note device, the Galaxy Note 9, it seems like its revealing hints about the handset in a different manner. Recently, a device which employs the same rumored specifications as the latest Galaxy Note phone emerged on Geekbench, giving fans and consumers a preview of what’s to come. According to the Geekbench listing, the device was tagged as ‘SM-N960U,’ which is reminiscent of Samsung’s past installments in terms of naming sense. 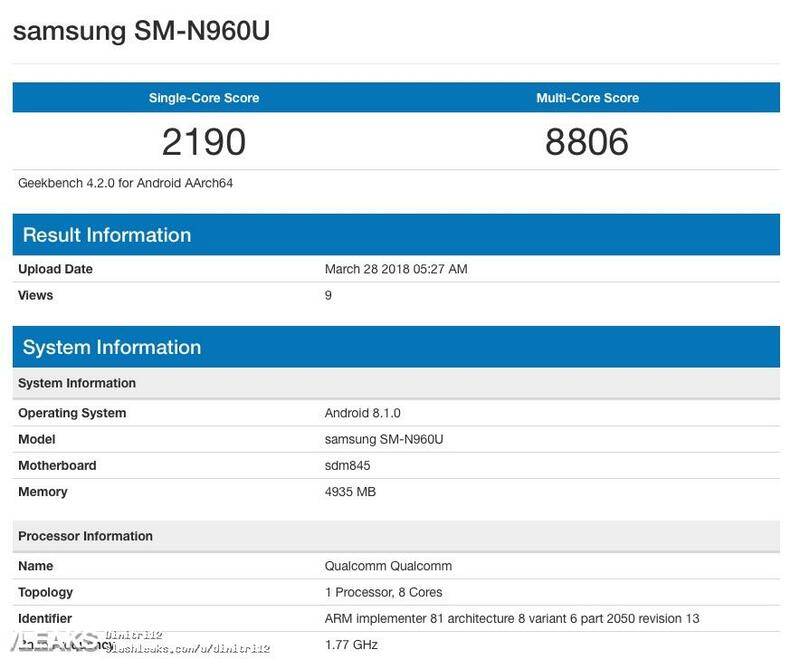 The rumored Galaxy Note 9 has Qualcomm’s latest Snapdragon 845 processor inside as well as 6GB of RAM and Android Oreo in tow, as reported by Slashleaks. However, what caught the attention of many is the single-core and multi-core tallies of the device, which is significantly lower when compared to the S9 who, similarly, carries the latest Snapdragon chip. BGR argues that this fluctuation in performance may well be caused by early software tests and other hardware components that are currently being tested on the handheld. Forbes says that the device is still in its infancy in terms of firmware and hardware, that’s why the test scores are on the lower end. They also add that various optimizations and improvements are bound to be integrated into the device to further speed up its processing power. BGR also agrees with this, they indicate that the Galaxy Note 9 will be as powerful as the S9 roster when it drops sometime this summer or fall. In other developments, the Galaxy Note 9 is allegedly coming with a bigger battery pack and an in-display fingerprint scanner. According to self-professed insider Ice universe, the new battery capacity for the smart handset will be 3850mAh that is a significant increase from Note 8’s 3,300mAh. TechRadar shares that Samsung is likely to make-do on this particular venture seeing as the disaster that is the Note 7 is already in the distant past. Regarding the in-display fingerprint reader, many are still torn if it’s really something Samsung intends to integrate into their new device. But all we can do now is to wait and see.